WHAT IS AT THE CORE OF YOUR BRAND? I am sure you have heard that your brand encompasses everything! It is everything you do and it is all aspects of your business, from your logo to how you clean your bathrooms are. This is great, but how do you start creating your brand? Getting started is as easy as answering this question… What are your core principles and values? Being able to answer this one question will do more to build your brand and culture more than anything else. Your core values and principles are your blueprint of how you operate. These values will dictate your interactions with clients, how your products and services will be presented and produced. These will become what you are known for. This translates into your entire brand. Zappo’s is a great example of how a companies core values develop your brand. Just look at how their values shaped them into revolutionizing customer service not only with online shoe sales but also across numerous industries. These are their core values! The infographic at the end of this shows you a variety of companies and what their values are. 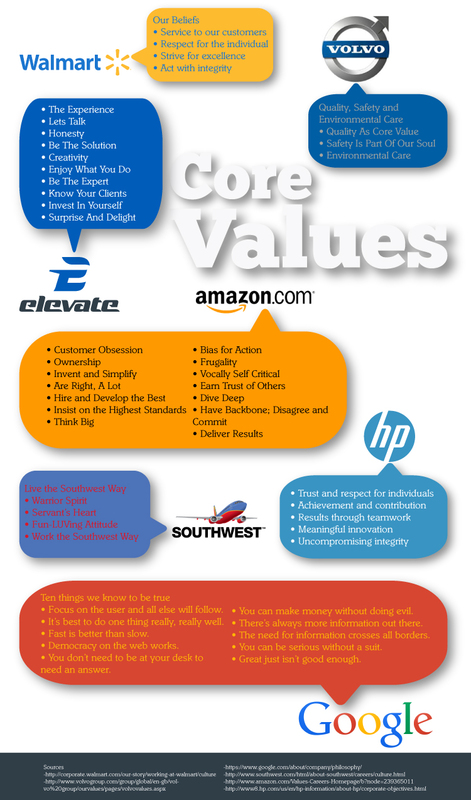 As you look at their different values you can see how their core values shape their brands. To determine the values of your brand you have to know and understand what your core values are. This will take mental and emotional exploration. Discovering your values is a process, and will take some time. As you get started be sure to keep these tips in mind. – Keep it to 10 or less! By keeping your value list shorter it makes them more memorable and potent. This will also help you and your employees adopt these values. This can be a tough one. We naturally think of ourselves as the being the best possible versions of ourselves or think of ourselves as the worst. So to get a true idea of our values it can help to get the outside opinion from individuals you trust. Be very selective in who you ask, they need to have a true understanding of you. Are these things you can actually have. Don’t set your own bar so high that you will never encompass these items. Write down every idea, but once you have created a healthy list, lets refine your list by giving each value a ranking. Then start working with the highest ranked ideas and draw these ideas out. As you develop these ideas out, take time, this whole thing is a process. By letting time pass you will be able to see the ideas that were more emotionally driven and may have been generated more in the moment than values that will last the passing of time. Even though your brand is everything, by creating and discovering your own core values and principles you have created the foundation of which you can build your brand. It is time for you to put pen to paper and start discovering your values and principles. Start building your brands foundation. Good Luck.